Baa, baa Black Sheep, have you any wool? Last night out again, with a friend—for a regular dinner (economy!) out. Knitting has been confined to work—and my subway ride home. Still, I have 4.5 inches of the leg done, and I still think I will be able to finish these socks up by close of day MONDAY- May 31st. 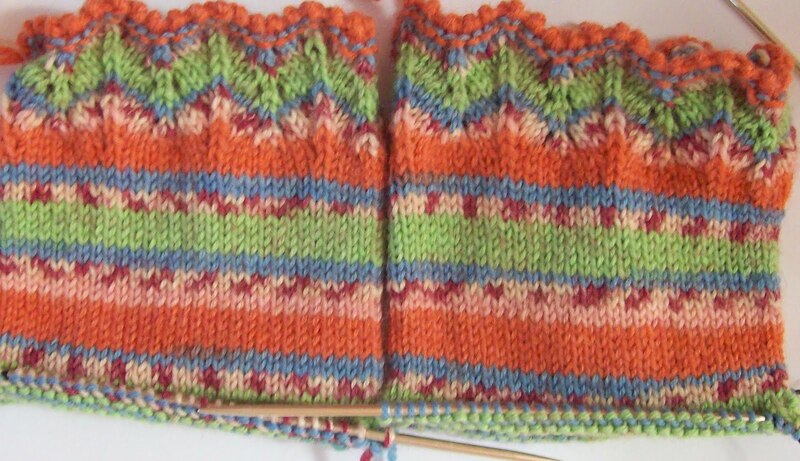 Top down, toe up—foot first, afterthought leg as Cat Bordhi suggests, diagonally, spirally, colorfully, economically, extravagantly, practically—every possible way to knit socks excites me! And in the background—I am doing a bunch of things too.. Documenting some of my designs, editting others to make them clearer, and easier to read, writing and writing and organizing and organizing. I tend to do work like this in a clump—and then let things slowly devolve to chaos--and chaos is near! Summer is here –the official beginning of summer in US is Memorial day weekend—forget the cosmic change of seasons. (Summer ends before the vernal equanox—at labor day) So the pool (all newly renovated and spiffed up) opens Friday. And this summer, I am going to start bike riding—again after years and year of not doing it. I plan to start slow—15 minutes at time, and build up muscles and stamina—and to make bike riding a regular part of my exersize routine. I don't like exercise routines. But I do like bike riding—which is fun, not exercise. Your new socks are really pretty! Can't wait to see them finished. Totally there with you about the exercise thing. And also, where can I get a job that allows me to knit while I'm there? I want some of that.